This book is subtitled: How To Turn Antiques & Vintage Shopping Into Free International Travel. Now, if you're a bit of a sceptic you're probably already thinking, yeah, right. As if I can do that. But wait! Before you make a rash decision, consider this: author Debra Palmen makes her living by travelling and shopping the world for free. And she has plenty of hints for you if you're willing to give it a try. Debra and her husband Doug have spent the last 30 or so years buying and selling antiques and vintage, and in this book Debra is sharing what they've learned. "I wish someone had taken us under their wing and told us their buying secrets when we first started," she writes. "We learned what to do over a long time, through lots of trial and error. But you don't have to... I'm sharing what we've learned. This book details exactly what works for us... All our secrets are revealed, from things you might think of to details you wouldn't guess." Part Two is the fun part, and even if you never intend to travel and shop as a business - and let's face it, most of us never will - you'll get heaps of travel information for wherever in the world you'd like to go and maybe do some personal antiquing while you're there. Fancy a trip to the UK? Don't forget to visit the town of Diss. You've probably never heard of it, but that's the point of this book! Diss, says Debra, is an English hamlet with a population of 7000 and one of the most interesting antiques and vintage auctions you'll find in England. Spending some time in London? Follow the list of antique centres, shops and markets and make sure you're there on the right day for the best fairs. Travelling up to the Midlands? You'll need the chapter on navigating Newark: the biggest antique fair in Europe. Maybe you fancy a path less trodden. Finland, for example. Yep, Debra and husband Doug have been shopping for antiques in Helsinki and you can benefit from their experience. They've also been to Bruges, Hong Kong, Monaco, Montsoreau, Paris, Morocco and Istanbul. You can shop for antiques in all of them. Travel & Shop The World For Free is two things. It's a serious guide for anyone intending to set themselves up in the business of international antiques trading, and it's a jolly good read for anyone who's ever wanted to add to their collection while travelling (wouldn't that be nearly all of us?). Only now, you can do it with insider knowledge. Highly recommended. Previously we told you about a new series of books by Kathy Morgan. The first in the series, The Limner's Art, was a really entertaining read so I was more than happy when the second one arrived in my mailbox. The Bronze Lady continues with the lives of the characters we met in The Limner's Art, but this time it focuses more on auctioneer Paul Black, who seems to be the target for the dispersal of fake bronze figures. I can't give too much away because I still have about 100 pages to go, but so far it's been just as good as The Limner's Art. I love Kathy's attention to antique detail - you can tell she's been in the trade and her style of writing is tailor made for antiques and collectables enthusiasts. 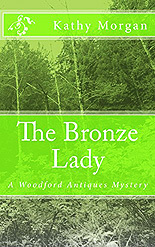 Both The Bronze Lady and The Limner's Art are part of the Woodford Antiques Mystery series, with more to come. And dare I say, they would make the perfect Christmas stocking filler!